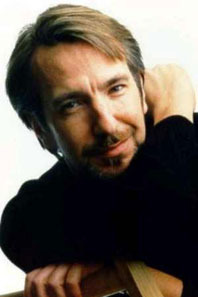 Alan Rickman is an English actor, famous for film roles as Harry Potter's Professor Snape and as the sneering terrorist who battled Bruce Willis in Die Hard. His family was not well off, and his father died of cancer when Rickman was 8. He performed on stage in school, and it was an all-boys' school, so Rickman's early roles included "slutty barmaid" and the sixth wife of Ali Baba. He worked as a graphic designer for several years before deciding, at age 26, to become an actor. He enrolled in London's Royal Academy of Dramatic Art, and began appearing on stage in the late 1970s. His first role of note was as Valmont in a West End production of Les Liaisons Dangereuses, which he later reprised on Broadway. At age 32 he first appeared on television, as Tybalt in a BBC production of Romeo & Juliet. After that he had supporting roles in three BBC miniseries, before playing the bad guy in Die Hard -- Rickman's first movie. Later films included Robin Hood: Prince of Thieves, Bob Roberts, Dogma, Love Actually, and Galaxy Quest. He met his long-time lover Rima Horton when he was 19, and studying graphic design at Chelsea College. They've never married, but have lived together since 1977. She taught applied microeconomics at Kingston University until her retirement in 2002, and is a local politician, affiliated with the Labour Party. There are whispers she might run for Parliament.